Sew Susan: From one thing to another. The brief I am currently working on is all about the forest and I intend to use tweeds, wools and checks as well as lots of various styles of stitching. To keep my cost low I decided to go down the road of recycling, I visited many charity shops and got a couple of nice pieces, a mans jacket, a pair womens collotes. A few friends very kindly donated various bits and bobs they thought I may be able to use. 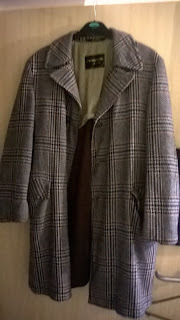 One piece that was donated was this mans coat (50% wool 50% Acrylic). Yesterday I started to cut the coat up in preparation for one of the pieces I am making but then it turned in to this little guy. Please meet Mr Coats Solomon isn't he fab (even though I do say so myself) sadly he is not mine to keep even though I am head over heals in love with him. However, I know his new owner will think he is great too. I seem to have a thing for rabbits but who can blame me their so cute. He is fabulous Susan! I like toys made of tweed. 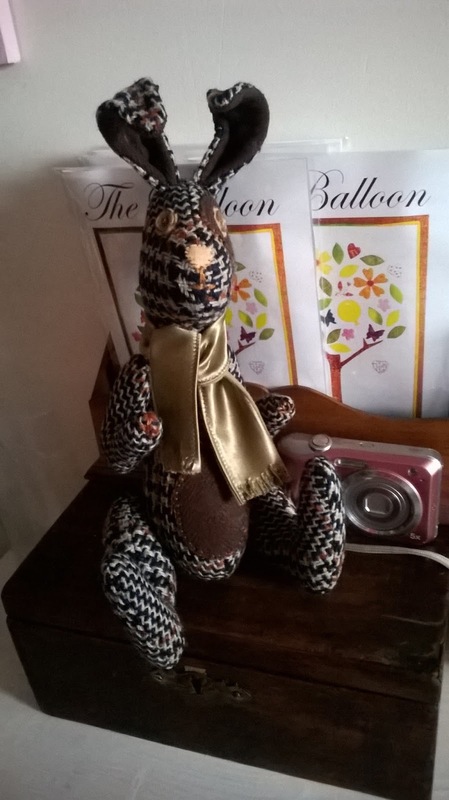 Another friend of mine made a whole row of teddies from tweeds. It was a sample book from the scrapstore. Too cute! You're so clever!